I am reviewing the Brother MFC-9840CDW colour laser multifunction printer which is pitched as a general high-throughput document “workhorse” for a small to medium business. 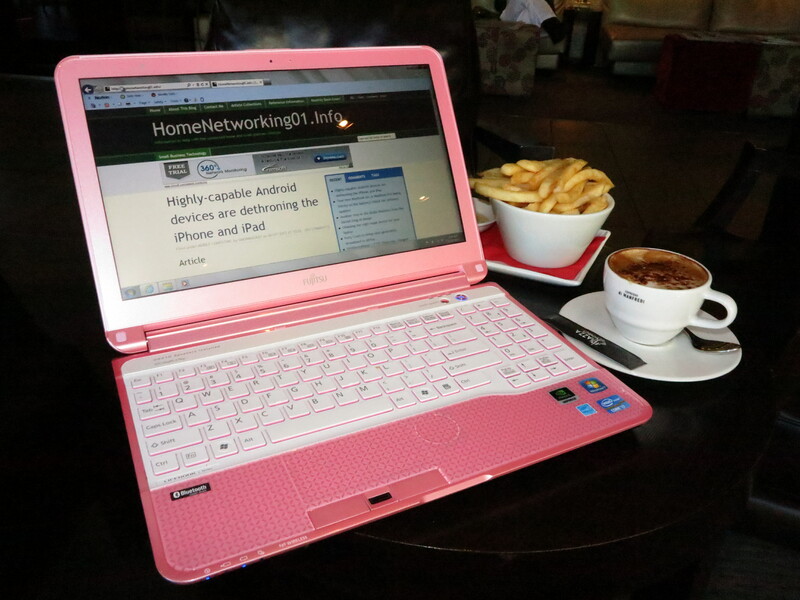 This machine can connect to a network using Ethernet cable or 802.11g Wi-Fi wireless. When you enter the WPA-PSK network password, you can use the numeric keypad to enter it “SMS-style”. I have tested it on Wi-Fi wireless and it hasn’t “gone off the radar” on the network even if it goes in to energy-save mode. Still, I would prefer printers like this one to be connected to am Ethernet or HomePlug powerline network rather than using a wireless network. 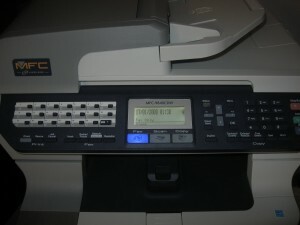 The printer uses a bitmap monochrome display which is backlit using a white light and it can make the display easier to read. As well, the typefaces for the display are easy to read even for people with limited sight. The keyboard is also laid out in a logical manner and is easy to read. 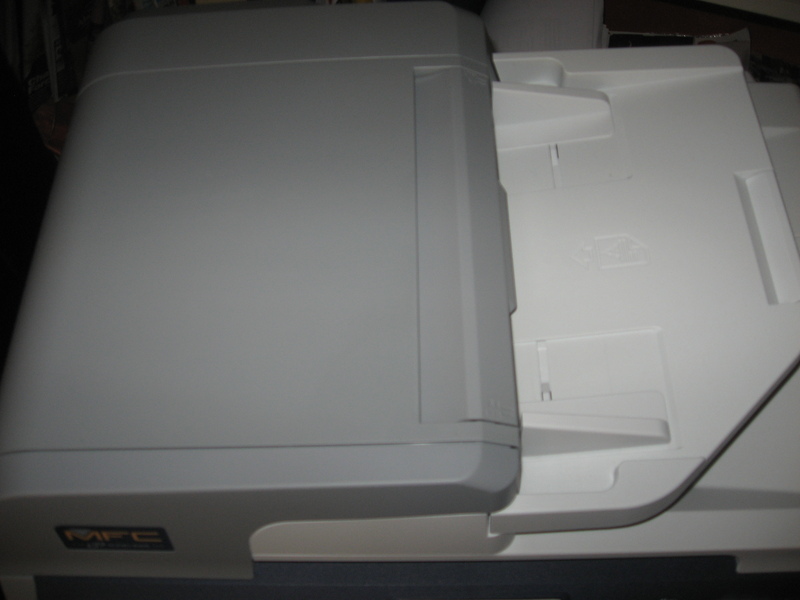 The unit has regular support for Super G3 colour faxing over the regular telephone line service to a standard of a business-class fax machine. 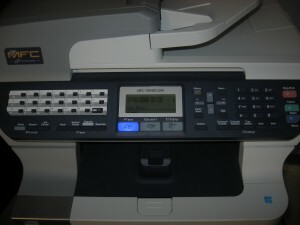 This unit can only accept fax documents from the scanner or a computer which uses the “print-to-fax” driver supplied by Brother. It has inherent support for email-based (T.37) IP-fax operation as well as regular Super G3 colour faxing over phone lines. This is whether it works as a receiving / transmitting endpoint or as an “off-ramp” to regular fax machines. Users can enter their destination email addresses from the control panel by using the numeric keypad in a manner similar to entering text on a mobile phone. But, as I have mentioned before in the Brother interview and an article on IP-based faxing, this feature is very hard to provision and use. The owner needs to establish a separate email address for best results as well as know the SMTP and POP3 details for their email service. Also, at the moment, it doesn’t support any colour “fax-over-email” functionality because as far as I know, this standard doesn’t have any support for colour transmissions. When you fax from the unit, there is twenty buttons for one-touch dialling but there is also a “shift” key to gain access to a further twenty fax numbers for one-touch dialling. This also works in addition to a large “speed-dial” registry for other regularly-used fax numbers. This registry can also handle email addresses for T.37-compliant IP-based faxing as an alternative to regular telephone numbers. The unit doesn’t have a colour LCD display nor does it have SD card slots for printing of images from digital-camera cards. But it uses an up-front USB port which allows you to print images from PictBridge-enabled digital cameras, camcorders and mobile phones. The same port can be used to print TIFF, PDF, JPEG and XPS files from USB memory keys but you would have to know your desired image’s or document’s file name and where it is on the USB memory key. When you print photographs, the pictures come out rather dark and this may be a consequence when a colour laser printer is used to do this job on plain paper. It can be good enough when you need “there-and-then” hard copy of pictures on a digital camera. As well, like all other multifunction printers you aren’t able to send pictures by email or fax from the USB slot or PictBridge. 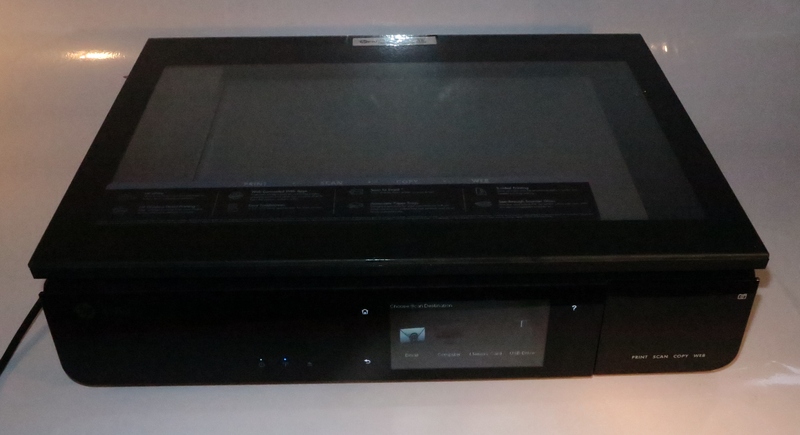 The scanner uses a conventional fluorescent lamp to illuminate the document rather than the LED “bar” used in all of the other multifunction printers that I have reviewed. This may yield benefits by providing even lighting for scanning the work but can be requiring replacement on a regular interval for a busy machine. There is a double-sided automatic document feeder but I have noticed that it has some problems in its use. Here, it can cause some documents to “buckle” up when they are being turned over and this behaviour is more so with older documents that are being scanned. This behaviour is also highlighted with the access panel at the top of the automatic document feeder “creeping open” during the duplex cycle. The ADF has a separate slot where the document partially comes out during the “turnover” cycle. It is also worth knowing that it takes 17 seconds / page to scan both sides of a regular office document. The reason I am paying attention to this is because most businesses may want to use a double-sided automatic document feeder to expedite the scanning of documents for electronic archiving or optical-character-recognition. Similarly, they may want to use this feature to fax or copy both sides of a document. 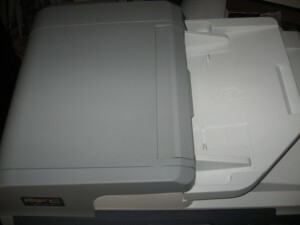 Duplex automatic document feeder with narrow slot for paper to emerge when "turned over"
The printer is very reliable although, because it uses an older colour-laser print engine, the cost of replacement toner cartridges is more expensive than the HL-4150 machine that I reviewed previously. Another penalty of the older mechanism design is a longer duplex-print cycle where only one page at a time can be printed on both sides. Other than that, the printer is very reliable especially when it comes to large print jobs. Infact I have sent through a single-side print of a 225-page document then followed it with the same document printed double-sided and the printer worked very smoothly. For a machine of the price range, it could benefit from a colour LCD display and could also benefit from a memory card reader for “ad-hoc” printing from digital camera memory cards. The automatic documet feeder could do with some improvement for a high-duty-cycle type especially when it comes to reliability when doing a double-sided scan of documents printed on older paper. It, like most other fax-enabled multifunctions, could have support for a “fax-from-mixed-source” function where a monochrome or colour fax job to a single destination could be constructed from document pages scanned via the automatic document feeder; document pages scanned directly on the scanner glass (such as bound or stapled documents and till receipts) and / or digital images from a digital camera or user-attached flash storage. 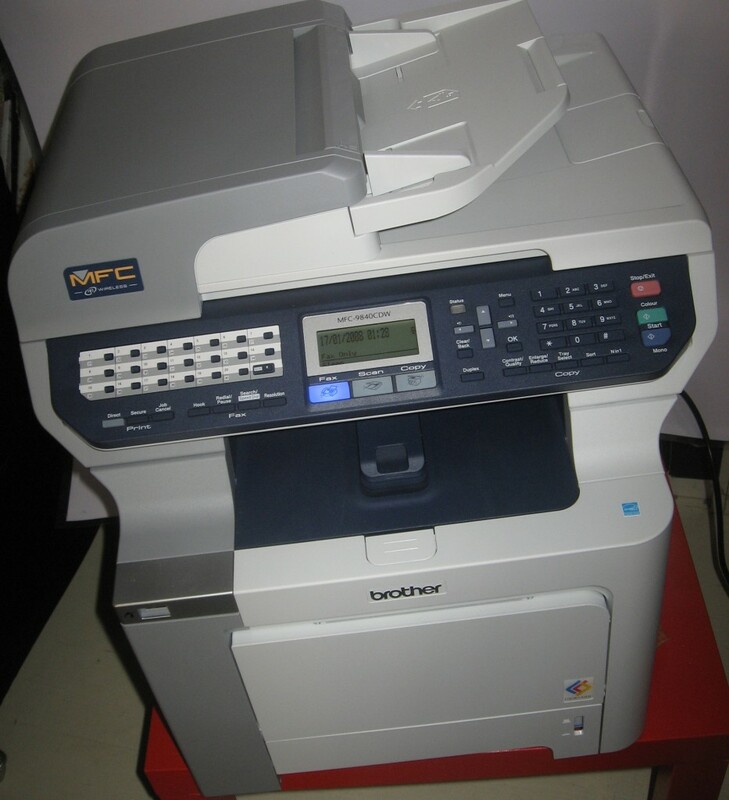 This multifunction printer does work well if you intend to use it as a printer for many short-run colour jobs or use it as a high-traffic high-usage machine and not do much in the way of archiving older paper documents to electronic form. The printer could be cheaper to run as far as materials are concerned if a business expects to buy or specify it for use as the only document centre for their operations.